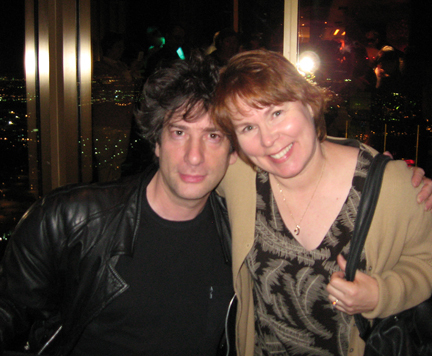 Neil Gaiman Live in Las Vegas! As promised here’s the scoop: Vegas Valley Book Festival 2008 got kicked off with a keynote address by one of my fave authors, Neil Gaiman. Gaiman’s address began with a short reading from his latest The Graveyard Book his spooky homage to Kipling’s The Jungle Book. Gaiman spoke about the impact of books, stories, and reading on his life as a youngster in England and the impact that stories of all kinds and from all mediums continue to have on children and adults everywhere and in every time. In his rambling address he talked about writing, publishing, genres, and “where do writers get their ideas anyway?” (answer: everywhere). Yours truly gets a pictures with the gregarious and gracious Mr. Gaiman. People asked whether there will be sequels to several of his works. He said he’d really like to do one for The Graveyard Book, and hinted that there may someday be one for American Gods (I’m so there!) and maybe Neverwhere. Had a great time. Late night, and Neil totally deserves some time off, but as we now know he doesn’t do holidays well; sneaks off to write in a deck chair. That’s OK Neil, use some sunscreen and take extra ink, we’ll wait. PS: The Mix at Mandalay was the site of the after party. On the 64th floor dark, all painted black with floor to ceiling windows overlooking the strip. Fabulous, but LOUD, and disorienting. The restrooms feature a wall of glass in every stall, black “throne” facing out to space, darkened interior, you pee facing the world. Weird. And yes. Here’s where I’ll be tonight: http: Vegas Valley Book Festival Keynote address. Have I pimped this enough yet? Later on a party… photographic evidence coming later.